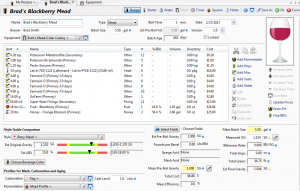 This article will cover some of the mead features in BeerSmith 3 software. Despite a lifetime passion for beer, mead has always been one of my favorite beverages – especially big fruit meads. So as I was putting together BeerSmith 3, I also made a lot of mead (many dozens of gallons of it) to make sure I got things right. I have 9 meads on tap at the moment – primarily large melomels. Making your first mead recipe starts much like you would for a beer recipe. Click on the add recipe button and enter the name and brewer. A very important step is to select the Type of recipe to “Mead” which will enable a number of mead related features. Then you can pick your equipment profile. Standard size mead profiles such as 5 gal (19 l), mini 3 gal (11 l) and large 10 gal (38 l) mead equipment profiles are set up in the program already, though you can create your own profiles if doing something special like a hopped mead where you might need a boil phase. Down in the style section you can choose mead styles from the current BJCP style guide and also choose a color for your mead, as meads do vary with the quantity of fruit and honey used. At this point you can start adding ingredients. BeerSmith 3 incorporates a large number of new ingredients. Many of the most popular honey varietals are included in the fermentables list so you can choose your favorite there and add it to your mead recipe. As you add honey (usually by weight) the program will also show you the volume of honey used to make measuring the honey easy. The necessary mead additives are also in the Misc database so you can add things like Potassium Metabisulfite, Pectic Enzyme, Goferm, and other items. The vast majority of popular wine yeasts have also been added and you can use any of them just bey selecting a yeast strain. The yeast strains also have a new Alcohol Tolerance field which limits the fermentation for very high gravity meads. Some beta testers also have used the yeast alcohol tolerance field to limit their fermentation to a certain alcohol level when using Sulfites and Sorbates to halt fermentation, a technique some mead makers use to leave residual sugar. Because alcohol tolerance is counted in the software, you can get a fairly accurate estimate of original as well as final gravity for your mead. There are also options for carbonating your mead if desired as well as setting a fermentation profile for long term aging. 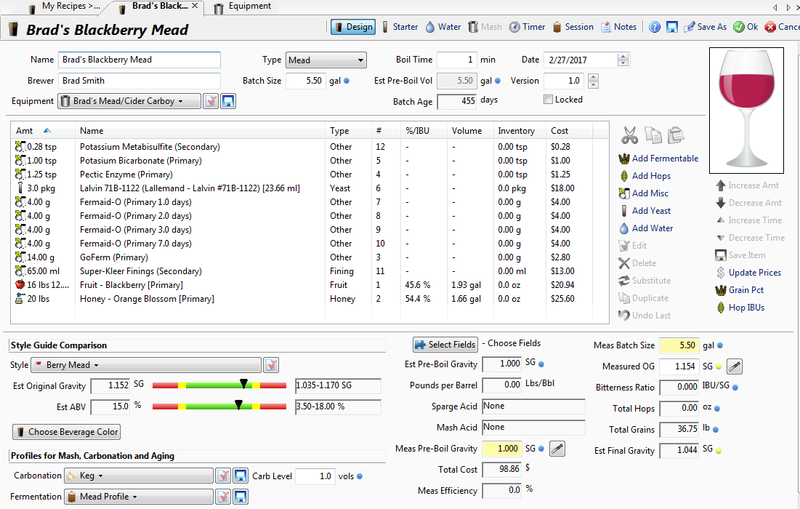 Several popular mead aging profiles are preloaded in the software. Most modern mead makers use a no-boil method for mead making involving both degassing and the addition of staggered yeast nutrients to promote a rapid fermentation. 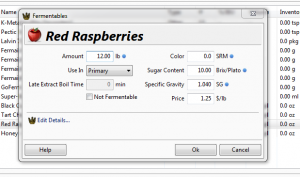 BeerSmith supports this on the yeast starter tab where it will estimate your yeast needs, typically in grams since most of us work with wine yeast, and also the nutrients needed. It will also estimate the GoFerm and water needed to properly hydrate the yeast and display this on the brew sheet. 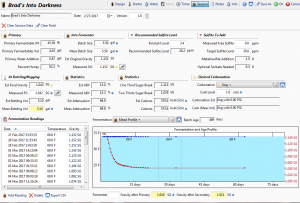 BeerSmith 3 supports the two most modern nutrient schedules: TONSA-2 and TiNOSA. The first uses Fermaid-O and the second Fermaid-K. You can calculate the staggered yeast nutrient needs right on the starter page and there is a button at the bottom that lets you then add these additions directly to your recipe ingredient list. It even takes into account items like the percentage of fruit used to avoid adding too much nutrient to fruit meads. There is also a separate mead nutrient tool on the tools menu if you want to calculate this outside of a recipe. 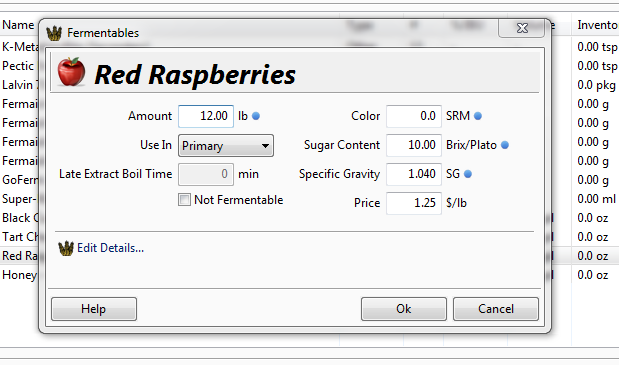 BeerSmith 3 now has native fermentable types for fruits, juices and honey, and a significiant number of them preloaded. If you don’t find what you’re looking for you can always add your own fruits or juices and we’ve made it much easier now as you really only need to know the brix value or take a hydrometer reading to get an accurate entry. However many of the popular juices and fruits are preloaded and you can find additional ones using the add-on button. When working with whole fruit, I’ve found its most accurate to crush or extract some juice from the whole fruit and take a hydrometer or refractometer reading on that sample. For example when working with raspberries I found the juice sugar content to be about 10 Brix or 1.040 SG when I measured it and this compared very well to the gravity contribution of the whole fruit in the final mead. Obviously you do get more waste/losses when working with whole fruit however. A feature of BeerSmith 3 that a lot of people will enjoy is the way many dialogs are tailored to the task at hand. For example the mead session page show’s data relevant to mead making like the weight and volume of all fermentables used along with an estimate of water needed. 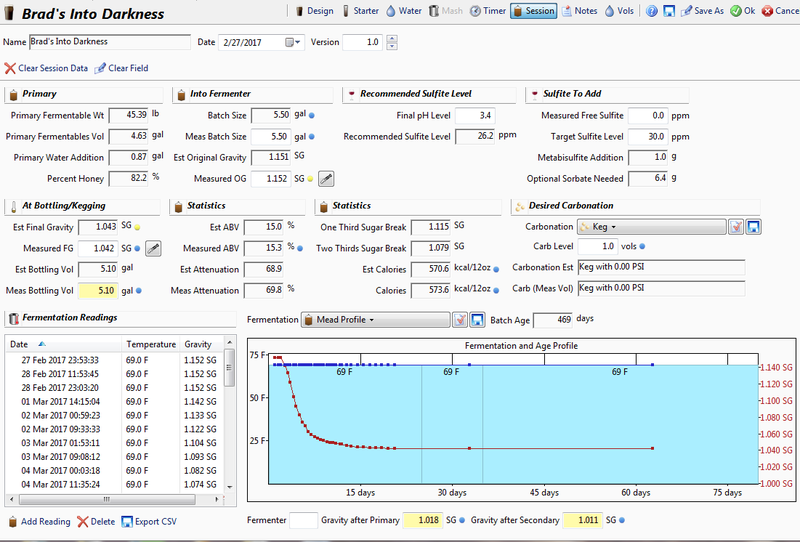 It shows the percent of fermentables coming from honey as well as the relevant session data. Down on the bottom you can track progress of your fermentation and it also now shows the batch age in days of your mead as it ages so you don’t have to guess. The important 1/3 and 2/3 sugar breaks are shown so you know when to add nutrients or throttle back on your “degassing” when making a mead. Even estimated calories and carbonation options are shown. On the top right there is also a built in sulfite calculator so you can fine tune your sulfite levels before bottling. This tool takes into account pH levels and sulfite levels measured if you have the appropriate pH meter and sulfite test kit. Naturally like with beer, you can also print out a brewsheet to guide your mead making session, and it will be customized for mead making to show things like the critical volumes, yeast hydration recommendation and recommended nutrient additions. So that’s a quick overview of the mead features in BeerSmith 3. I’ll also be publishing videos shortly on some of these features if you want to see it in action. Thanks for joining me on the BeerSmith Home Brewing Blog. Be sure to sign up for my newsletter or my podcast (also on itunes…and youtube…and streaming radio station) for more great tips on homebrewing. Nice add to the software, I always just swagged it a bit, then transfer to a cask for aging..takes me about 6 months for a few gallons.